In this study, Malacosoma neustria larvae infected by Bacillus thuringiensis subsp. kurstaki were fed with 4 different types of plant species, Elaeagnus rhamnoides, Quercus cerris, Coryllus maxima and Crataegus monogyna, in order to see the effects of chromium, nickel, copper and zinc heavy metal ions in plants on the survival and the immune enzymes of these larvae. The larvae fed the C. monogyna plant with the highest zinc content had the lowest survival rate. In the infected groups, the catalase enzyme activity was the highest in larvae fed with the Q. cerris plant, which has a high chromium content, and the lowest in the larvae fed with E. rhamnoides. In the larvae fed with the highest copper-containing Q. cerris plant, the catalase enzyme was higher than the larvae fed with other plants. The larvae fed with C. monogyna with the highest zinc content had the highest glutathione peroxidase activity. The lowest glutathione peroxidase activity was found in the larvae fed with E. rhamnoides having low zinc content. Superoxide dismutase activity was the highest in the infected larvae fed with the highest zinc containing C. monogyna. The highest number of hemocytes were found in the larvae fed with E. rhamnoides containing high amounts of nickel and copper, while the lowest hemocyte count was found in larvae fed with C. monogyna plant, where the amount of nickel and copper was the lowest. Bu çalışmanın amacı 4 farklı bitki türü Elaeagnus rhamnoides, Quercus cerris, Coryllus maxima ve Crataegus monogyna ile besleyerek Bacillus thuringiensis subsp. kurstaki tarafından enfekte edilen Malacosoma neustria larvalarının hayatta kalmasına ve bazı bağışıklık enzimlerine bitkilerdeki krom, nikel, bakır ve çinko metal iyonlarının etkisini araştırmaktır. Düşük nikel miktarına sahip Q. cerris ve C. monogyna bitkileriyle beslenen larvalarda hayatta kalma oranı yüksek nikel miktarına sahip olan E. rhamnoides ve C. maxima’ya göre daha düşüktür. En yüksek bakır miktarına sahip Q. cerris bitkisi ile beslenen larvalarda katalaz enzimi diğer bitkilerle beslenen larvalara göre yüksektir. En yüksek çinko ve en düşük nikel miktarına sahip olan C. monogyna ile beslenen larvalarda glutatyon peroksidaz aktivitesi en yüksektir. Düşük çinko ve yüksek nikel miktarına sahip olan E. rhamnoides ile beslenen larvalarda en düşük glutatyon peroksidaz aktivitesi bulunmuştur. En yüksek çinko içeren C. monogyna ile beslenen enfekte edilmiş larvalarda süperoksit dismutaz aktivitesi en yüksektir. Yüksek nikel ve bakır miktarına sahip E. rhamnoides ile beslenen larvalarda hemosit sayısı en yüksektir. En düşük hemosit sayısı ise nikel ve bakır miktarının en az olduğu C. monogyna bitkisi ile beslenen larvalarda bulunmuştur. Ahmad S., Pardini R.S., 1990. Mechanisms for regulating oxygen toxicity in pyhtophagous insects. Free Radical Biology and Medicine, 8: 401-403.Ames B. N., Shıgenaga M. K., Hagen T. M., 1993. Oxidants, antioxidants and the degenerative diseases of aging. Proceedings of the National Academy of Sciences, 90: 7915-7922.Bodenheimer, F. S., 1958. Türkiye’de Ziraate ve Ağaçlara Zararlı Olan Böcekler ve Bunlarla Savaş Hakkında bir Etüt. (Çeviren: N. Kenter), Bayur Matbaası, Ankara, 320 s.Bolter C. J., Chefurka W., 1990. The effect of phosphine treatment on superoxide dismutase, Catalase, and peroxidase in the granary weevil, Sitophilus granarius. Pesticide Biochemistry and Physiology, 36 (1): 52-60.Boyd R. S., 2010. Heavy metal pollutants and chemical ecology: Exploring new frontiers. Journal of Chemical Ecology, 36: 46-58. Boyd R. S., Martens S. N., 1994. Nickel hyperaccumulated by Thlaspi montanum var. montanum is acutely toxic to an insect herbivore, Oikos, 70: 21-25.Boyd R. S., Shaw J. J., Martens S. N., 1994. Nickel hyperaccumulation defends Streptanthus polygaloides (Brassicaceae) against pathogens. American Journal of Botany, 81(3): 294-300. Butler D. C., Trumble J. T., 2008. Effects of pollutants on bottom-up and top-down processes in insect-plant interactions. Environmental Pollution, 156: 1-10. Butler C.D., Beckage N. E., Trumble J. T. 2009. Effects of terrestrial pollutants on insect parasitoids. Environmental Toxicology and Chemistry, 28: 1111-1119. doi.org/10.1897/08-440.1Büyükgüzel K., 2006. Malathion-induced oxidatif stress in a parasitoid wasp: Effect on adult emergence, longevity and oxidative and antioxidative response of Pimpla turionellae (Hymenoptera: Ichneumonidae). Journal of Economic Entomology, 99(4): 1225-1234.Chandra R. K., 1996. Nutrition, immunity and infection: from basic knowledge of dietary manipulation of immune responses to practical application of ameliorating suffering and improving survival. Proceedings of the National Academy of Sciences USA, 93(25): 14304–14307..Cheruiyot D. J., Boyd R. S., Moar W. J., 2013. Exploring lower limits of plant elemental defense by cobalt, copper, nickel and zinc. Journal of Chemical Ecology, 39 (5): 666-674. Chrascina M., Kafel A., Migula P., 1996. Patterns of detoxifying enzymes in larval stage of Smerinthus ocellatus L. exposed to cadmium, tocopherol or quercetin. Studia Societatis Scientiorum Torunensis, 4: 31-37.Coop R. L., Kyriazakis I., 2001. Influence of host nutrition on the development and consequences of nematode parasitism in ruminants. Trends in Parasitology, 17(7): 325-330.Çanakçıoğlu, H., Mol, T., 1998. Orman Entomolojisi. İstanbul Üniv. Orman Fak. Yayın. 451 pp.Deaton C. M., Marlin D. J., 2003. Exercise-Associated Oxidative Stress. Clinical Techniques in Equine Practice, 2 (3): 278-291.Demirbağ Z., Nalçacıoğlu R., Katı H., Demir İ., Sezen K., Ertürk Ö., 2008. Entomopatojenler ve Biyolojik Mücadele, Sayfa 143, Esen Ofset matbaacılık, Trabzon.Dubovskiy I. M., Grizanova E. V., Ershova N. S., Rantala M. J., Glupov V. V., 2011. The effects of dietary nickel on the detoxification enzymes, innate immunity and resistance to the fungus Beauveria bassiana in the larvae of the greater wax moth Galleria mellonella. Chemosphere, 85 (1): 92-96.Duthie G. G., Wahle K. W. J., James W. P. T., 1989. Oxidants, antioxidants and cardiovascular disease. Nutrition Research Reviews, 2 (1): 51-62.Felton G. W., Summers C. B., 1995. Antioxidant systems in insects. Archives of Insect Biochemistry and Physiology, 29 (2): 187-197.Flohé L., Ötting F., 1984. Superoxide dismutase assays. Methods in Enzymology, 105: 93-104.Florea A. M., Büsselberg D., 2006. Occurrence, use and potential toxic effects of metals and metal compounds. Biometals, 19 (4): 419-427. Freeman B. A., Crapo J. D., 1980. Free radicals and tissue injury. Laboratory Investigation, 47 (4): 26-412.Galloway T. S., Depledge M. H., 2001. Immunotoxicity in invertebrate: measurement and ecotoxicological relevance. Ecotoxicology, 10 (1): 5-23.Garewal H. S., 1997. Antioxidants and disease prevention. Florida: CRC Press LLC, 3-19.Gelernter W. D., 1997. Resistance to microbial insecticides: The scale of the problem and how to manage it. In “Microbial Insecticides: Novelty or Necessity?” (H. F. Evans, chair)., Proc. Br. Crop Prot. Council Symp., 68: 201-212.Hansen B. M., Salamitou S., 2000. Virulence of Bacillus thuringiensis, In: Entomopathogenic bacteria: from laboratory to field application, Klewer Academic Publishers, London.Heliövaara K., Väisänen R., Kemppi E., 1989. Change of pupal size of Panolis flammea (Lepidoptera; Noctuidae) and Bupalus piniarius (Geometridae) in response to concentration of industrial pollutants in their food plant. 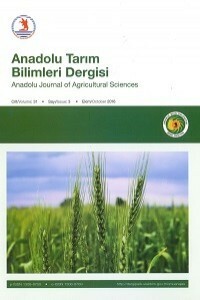 Oecologia, 79 (2): 179-183. doi: 10.1007/BF00388475.İren, Z., 1977. Önemli Meyve Zararlıları, Yayılışları ve Mücadele Metotları. Ankara Bölge Zirai Mücadele Araştırma Enst. Mesleki Eserler Serisi. No: 36.Jones J. C., 1962. Current concepts concerning insect hemocytes. American Zoologist, 2: 209-246.Kansu, A., 1955. Orta Anadolu Meyve Ağaçlarında Zarar Veren Bazı Makrolepidoptera Türlerinin Evsafı ve Kısa Biyolojileri Hakkında Araştırmalar. İstiklal matbaası, AnkaraLacey L. A., Frutos R., Kaya H. K., Vail P., 2001. Insect pathogens as biological control agents: Do they have a future? Biological Control, 21 (3): 230-248.Lawrence R. A., Burk R. F., 1976. Glutathione peroksidase activity in selenium deficient rat liver. Biochemical and Biophysical Research Communications, 71(4): 952-958. Lochmiller R. L., Deerenberg C., 2000. Trade-offs in evolutionary immunology: just what is the cost of immunity? Oikos, 88: 87-98. doi.org/10.1034/j.1600-0706.2000.880110.x.Lüch H., 1963. In methods of enzymatic analysis 2nd edition Edn. Bergmeye H.U., 885-888; Varlag Chemie New York, Weinheim and Academic Press.McCord J. M., Fridovich I., 1969. Superoxide Dismutase. An Enzymic Function for Erithro cuprein (Hemocuprein). Journal of Biological Chemistry, 244: 6049-6055.McGaughey W. H., Beeman R. W., 1988. Resistance to Bacillus thuringiensis in colonies of Indianmeal moth and almond moth (Lepidoptera: Pyralidae). Journal of Economic Entomology, 81(1): 28-33. doi.org/10.1093/jee/81.1.28Probst A., Bur T., Crouau Y., Bianco A., Gandois L., 2012. Toxicity of Pb and of Pb/Cd combination on the springtail Folsomia candida in natural soils: Reproduction, growth and bioaccumulation as indicators. Science of the Total Environment, 414: 187-197. doi.org/10.1016/j.scitotenv.2011.10.029.Sekendiz, O. A., 1974. Türkiye Hayvansal Kavak Zararlıları Üzerine Araştırmalar. Karadeniz Teknik Üniv. Yay. No: 62, Orman Fak. Yay. No: 3, 194 s.Sharma R. K., Agrawal M., 2005. Biological effects of heavy metals: An overview. Journal of Environmental Biology, 26 (2 suppl): 301-313. Stone D., Jepson P., Laskowski R., 2002. Trends in detoxification enzymes and heavy metal accumulation in ground beetles (Coleoptera: Carabidae) inhabiting a gradient of pollution. Comparative Biochemistry and Physiology Part C, 132 (1): 105-112. Sun H. X., Zhou Q., Tang W. C., Shu Y. H., Zhang G. R., 2008. Effects of dietary nickel on detoxification enzyme activities in the midgut of Spodoptera litura Fabricius larvae. Chinese Science Bulletin, 53 (21): 3324-3330. Tucker F. B., Wang K. X., Fang J., Lu S. L., 2004. Effect of chromium on hemolymph catalase activity and cocoon quality of two mulberry silkworm (Bombix mori L.) Races. Bulletin of Environmental Contamination and Toxicology, 73 (3): 443-447.Tuna S., 2007. Orta Anadolu süne, Eurygaster maura (Heteroptera: Scutellarıdae) populasyonlarındaki esteraz ve süperoksit dismutaz enzimlerinin elektroforetik analizi. Yüksek Lisans Tezi, Ankara Üniversitesi, Fen Bilimleri Enstitüsü, Ankara.van Ooik T., Pausio S., Rantala M. J., 2008. Direct effects of heavy metal pollution on the immune function of a geometrid moth, Epirrita autumnata. Chemosphere, 71(10): 1840-1844. van Ooik T., Rantala M. J., Saloniemi I., 2007. Diet-mediated effects of heavy metal pollution on growth and immune response in the geometrid moth Epirrita autumnata. Environmental Pollution, 145(1): 348-354. doi:10.1016/j.envpol.2006.03.008.Yanar O., Gömeç S., Topkara E. F., Solmaz G., Demir İ., 2017. The effect of plant quality on survival of Lymantria dispar (Lepidoptera:Lymantriidae) larvae infected by Bacillus thuringiensis Berliner subsp. kurstaki. Applied Ecology and Environmental Research, 15 (3): 837-847. doi.org/10.15666/aeer/1503_837847.